As I said in another thread last week I have a gut feeling Ferrari will finally do very well in Austria. It was on the cards last year and only the impossible task of passing a similar strong car gave Bottas the win last year. Exactly the same thing happened in Bahrain this year where Seb won because Bottas couldn't pass on fresher tyres. 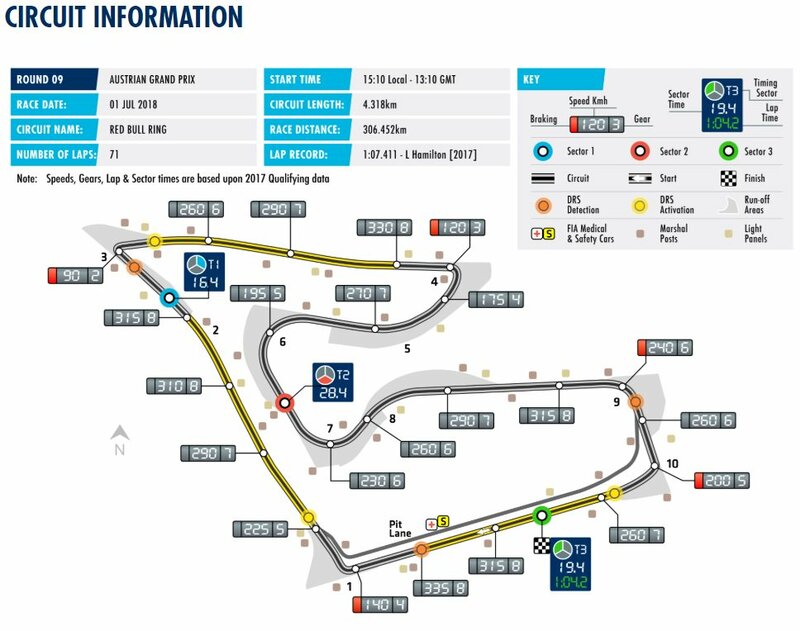 If you look at the circuit layout it's very similar to Bahrain. It's stop-and-go with a few corners midway through the lap. But what sets both circuits apart is obviously the altitude. Ferrari's engine/PU seems to be less thirsty than the Merc and that will give Ferrari the chance to run a richer fuelmix in Austria. For qualifying that should be a big advantage. 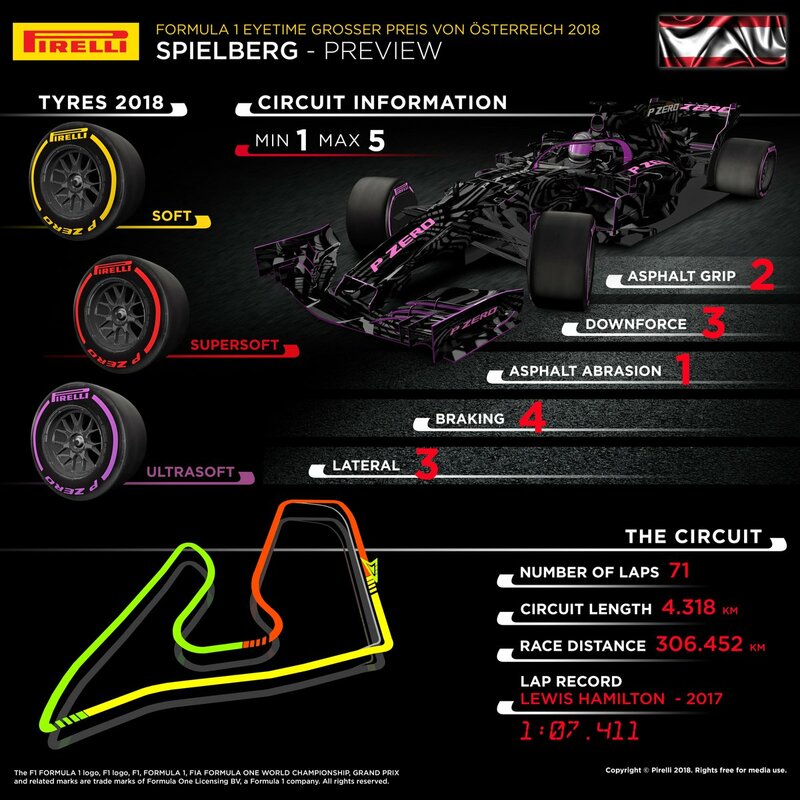 Original soft, supersoft and ultrasoft tyres will be used. That's better than Bahrain and the same as Baku. Ferrari sure could use a 1-2 finish here. 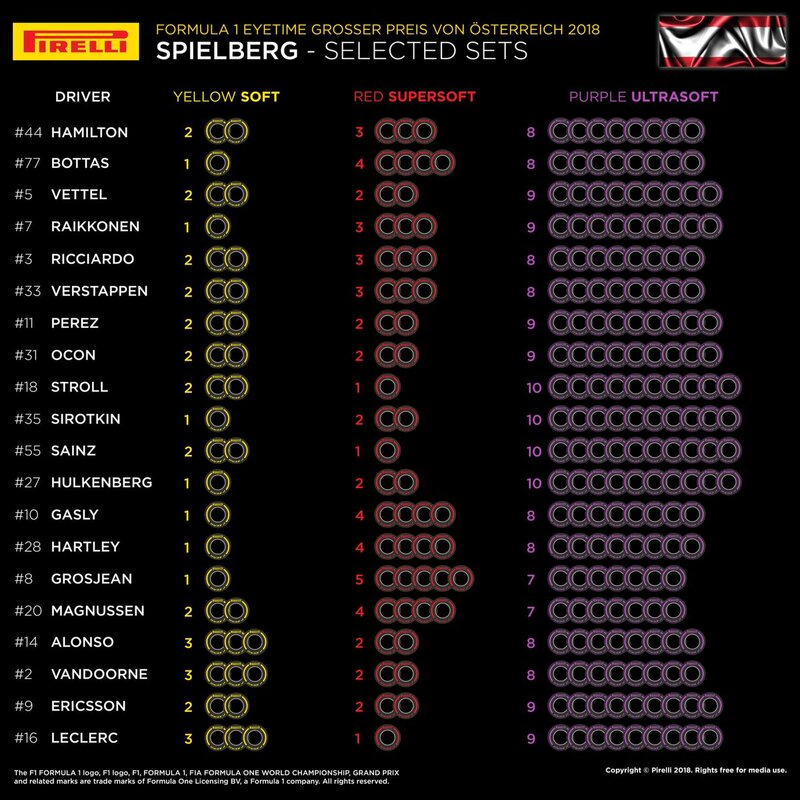 Tyres compounds up until Russia below. I'm glad the next race is this weekend. Is it going to be dry weekend in Austria? 50% rain Friday and dry Sat & Sun......you never know in these parts......weather changes constantly. Will the track also be painted to look like tires? I wonder how the drivers liked it? Seb needs the win in Austria because Lewis will win in GB and I predict a Merc 1-2 there. I suppose the chances are high of a HAM win at Silverstone, but it's not a certainty and what satisfaction it would give us to see a Ferrari win! Likewise we need to win in Austria. The weather in UK has been very hot recently but you can guarantee that by the time Silverstone comes round, it will change and the odds will be against us. But we'll try! I suppose the chances are high of a HAM win at Silverstone, but it's not a certainty and what satisfaction it would give us to see a Ferrari win! Likewise we need to win in Austria. OMG A Ferrari win at Silverstone especially if we could spring a 1, 2 out of the bag. A lot of people would find that a hard one to take. We keep our hopes high for Sunday and pray for a fair wind on Seb & Kimi's backs. I see Seb has been slated by the Italian press but he's old enough to handle all of that but I would hate young Charles to have to deal with similar at the tender age of 20. It could ruin him. It really is the lion's den when things go wrong. That would be so great in front of these HAM/Mercedes fans. 8 sets of soft tires. I think the soft tires will suit the sf71h very well. Just out of curiosity, what’s the car set up in Red Bull ring? Is it low downforce? The track is 700m above sea level, so there is less downforce due to the thinner air. Thinner air means the turbo works harder. So medium downforce? Do you think our car at the moment works best when at medium downforce circumstances? I would poop twice and die if Seb wins in Silverstone, but I don't see it happening. This is why a win in Austria with Ham finishing down the order is important. Current tyres + halo = more drag, so teams need to shed downforce. Straight line speed is more important here than cornering speed. What's medium downforce???? As to opposed to minimum and maximum downforce?? It's RedBulls track so not so many corners plus a third DRS....... so less downforce than Paul Ricard. Vettel: "Especially the pace of my teammate Kimi in the 2nd stint shows me: already on Sunday in Austria, everything can be different. There is no reason to panic." So RB are good at less downforce? I thought quite the opposite given the fact that their biggest advantages is coming from their chassis and aero and not their engine. [QUOTE=jgonzalesm6;977328]What's medium downforce???? As to opposed to minimum and maximum downforce?? It's" Max "imum Verstappen ! 2nd place! He's the guy to watch. Both ferraris needs to lock out front row. That’s imp, kimi needs to lift up his q3 performances. Vettel needs to avoid silly mistakes...!!! Already this year there are two, zero from ham. I think these mistakes might decide the championship. Will see this track should suit us much more as France. Yes Hamilton didnt make many mistakes but he was dog slow in Montreal, Baku, China. Seb was never lacking pace this year, Hamilton did, end of the story. I hope we will strike back in Austria.